Library of America, 9781931082549, 928pp. Alexis de Tocqueville, a young aristocratic French lawyer, came to the United States in 1831 to study its penitentiary systems. His nine-month visit and subsequent reading and reflection resulted in Democracy in America (1835–40), a landmark masterpiece of political observation and analysis. Tocqueville vividly describes the unprecedented social equality he found in America and explores its implications for European society in the emerging modern era. His book provides enduring insight into the political consequences of widespread property ownership, the potential dangers to liberty inherent in majority rule, the importance of civil institutions in an individualistic culture dominated by the pursuit of material self-interest, and the vital role of religion in American life, while prophetically probing the deep differences between the free and slave states. 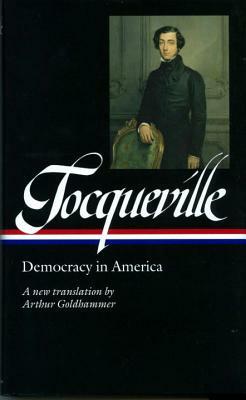 The clear, fluid, and vigorous translation by Arthur Goldhammer is the first to fully capture Tocqueville’s achievements both as an accomplished literary stylist and as a profound political thinker. Arthur Goldhammer is the award-winning translator of more than eighty French works in history, literature, art history, classical studies, philosophy, psychology, and social science. Olivier Zunz is Commonwealth Professor of History at the University of Virginia, and the author of numerous books including Why the American Century? He has also co-edited The Tocqueville Reader (Blackwell) and is president of the Tocqueville Society.